Featured Favorite Bird - House Wren. Learn all about House Wrens. ■ A House Wren weighs about as much as two quarters, but their small size does not keep them from harassing and pecking at much larger birds. They have been known to drag eggs and young out of nest sites they want – even occasionally killing adult birds. 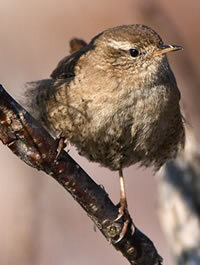 ■ The oldest known House Wren was nine years old. ■ The House Wren has one of the largest ranges of any songbird. It breeds from Canada through the West Indies and Central America, southward to the southernmost point of South America. ■ The House wren eats a wide variety of insects and spiders, including beetles, caterpillars, earwigs, and daddy longlegs, as well as flies, leafhoppers, and springtails. They also eat snail shells, probably for the calcium they contain and to provide grit for digestion. ■ The House Wren clutch size is 3-10 eggs with 1-2 broods. Incubation period is 9-16 days. Nesting period is 15-17 days. Eggs are white, pink-white, or grayish, speckled or blotched with reddish brown.